A great companion for early readers, Toilet Trouble will make its audience want to practice rhymes. 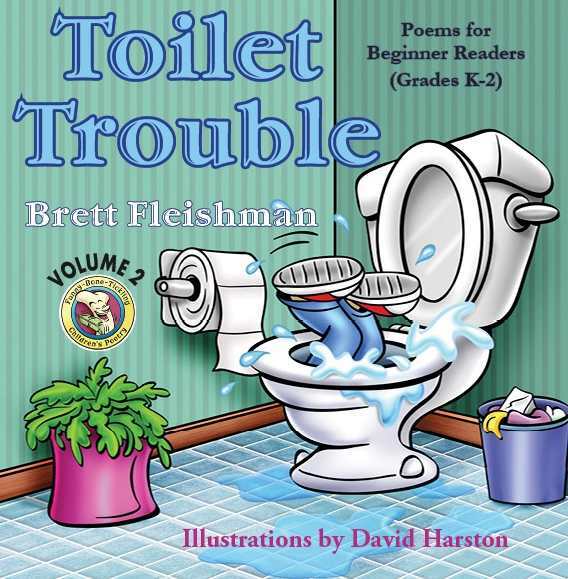 Brett Fleishman’s poems in Toilet Trouble are aimed at inspiring laughter through silly concepts as their audience learns to read. The book’s poems cover subjects from crocodiles in Crocs to a sister-eating vacuum, from a lazy rabbit to toilet troubles and centipedes for sale. The collection provides various lessons, but mostly includes standalone poems that are zany and fun. The poems are entertaining, putting a unique twist on the outcomes of everyday situations. In one, a sister suggests to her brother that he use a vacuum to clean his room, and she somehow ends up inside it. In another, a daredevil daughter gets to fly her father’s helicopter, but she doesn’t realize he’s tethered it to himself to mitigate the risk. In a different poem, a sister warns her brother to put the toilet seat down. When he doesn’t, she leaves it up and he falls inside. Some of the book’s unusual circumstances are simply wacky: a peach falling in love with a clementine who loves a tangerine instead; a giraffe used as a tetherball pole. The juxtaposition of different characters and situations is delightful and compelling. The poems’ rhyme schemes vary. In the aaaa scheme of “The Big Bad Wolf,” the wolf is “older than before” and has “come back for more,” but now his “huffs and puffs are poor,” and “what’s that on the door?” The poems are humorous in similarly singsong ways. “Ice Skating” issues a casual warning to stay out of the inner ice rink, and the image proves why: because there’s a hole in the ice with a shark fin peeking through. Similarly, “Binoculars” wouldn’t be as funny without the accompanying picture of the boy using his binoculars the wrong way. A great companion for early readers, Toilet Trouble will make its audience want to practice rhymes. It incorporates challenging words like “marathon” and “afoul” when it’s fun to do so, adding an additional teaching element. David Harston’s illustrations complement the poems and fill the pages with vibrant colors and silly images. What the poems leave unanswered, the illustrations explain in eye-catching ways. Not all pages include an illustration, but those that do benefit from their inclusion. Toilet Trouble helps early readers grasp otherwise difficult words by making reading fun. This amusing book includes known and new characters that teach kids about life in peculiar situations.